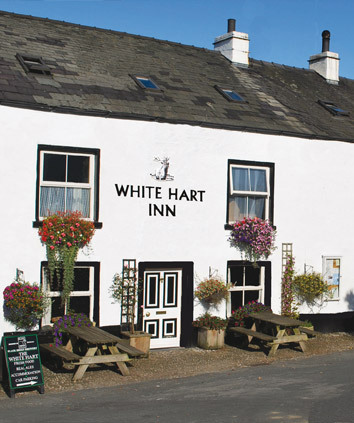 The White Hart in Cumbria offers an ideal Lake District bed and breakfast retreat to rest up after a good day's rock climbing, fell walking, fishing or cycling or to just relax and get away from it all. The village of Bouth is situated in the Lake District National Park, almost halfway between the southern tips of Lake Windermere and Coniston, surrounded by fields, fells and woodland. Just a 20 minute walk from the White Hart presents magnificent views of the Rusland Valley, Coniston Old Man and surrounding hills and mountains. As well as bed and breakfast we have a well stocked bar that has featured more than 200 guest ales and offers 15 malts including Balvenie, Cragganmore, Talisker, Lagavulin, Clyneliesh and Glenmorangie. We also provide an extensive menu with meat, fish and vegetarian dishes that are produced using local ingredients. CAMRA Good Beer Guide 2010 - the authoritative source for finding pubs that consistently sell good real ale. Cask Marque Accredited to May 2019 - Excellence in the service of cask ale, inspections made twice a year. Awarded to the licensee rather than to the pub. Cumbrian Best Kept Village Award - Bouth has been placed in the top three on several occasions.